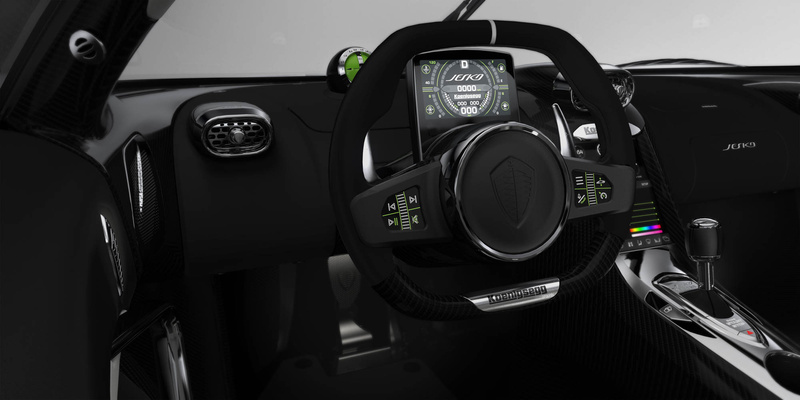 Koenigsegg Automotive, the Swedish specialty hypercar manufacturer, has unveiled their all-new supercar at the 2019 Geneva International Motor Show. 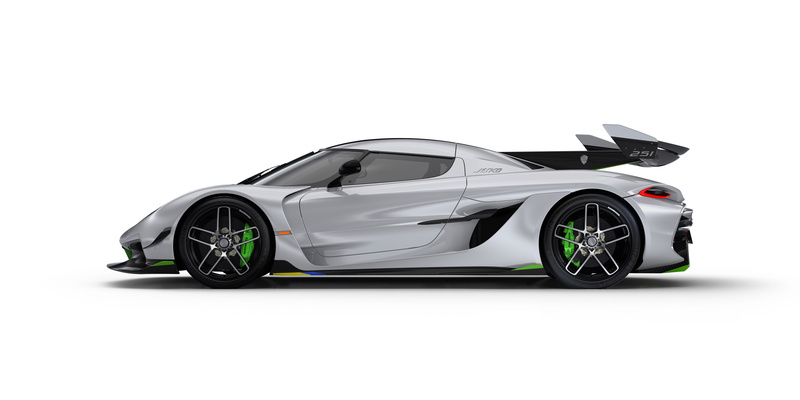 The Jesko, named after founder Christian von Koenigsegg’s father, is the Agera RS replacement and becomes the company’s track-focused, street-legal high performance car. Packing a big punch under the hood is a redesigned 5.0 litre twin-turbo V8 engine that produces 1,280 hp using standard gasoline, and 1,600 hp using E85 biofuel. Maximum torque increases to 1,100 lb-ft at 5,100 rpm. The car is capable of generating 2,200 pounds of aerodynamic downforce. The redesigned carbon fibre chassis provides its two occupants with more legroom, headroom and better outward visibility. The Jesko also features active rear-wheel steering. The new in-house designed Light Speed Transmission is a 9-speed multi-clutch unit that does away with traditional synch rings and makes changes between any gear possible. Modern DCT’s typically have two clutches, one for even numbered gears and another for uneven numbered gears. 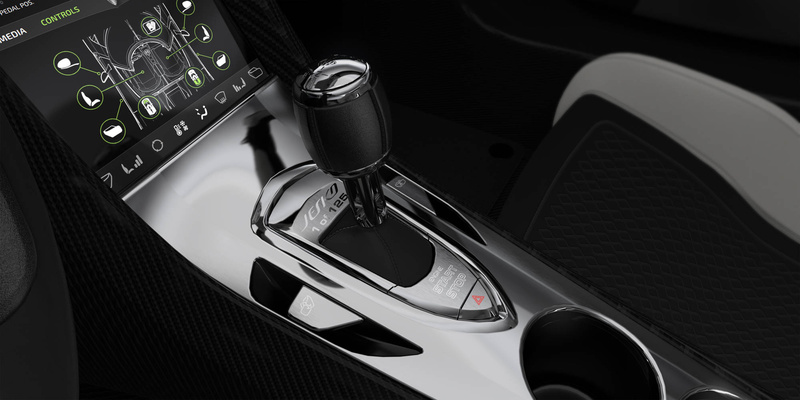 The Koenigsegg LST allows the driver to change to the optimal gear for acceleration, regardless of which gear they want to change into from the current gear. 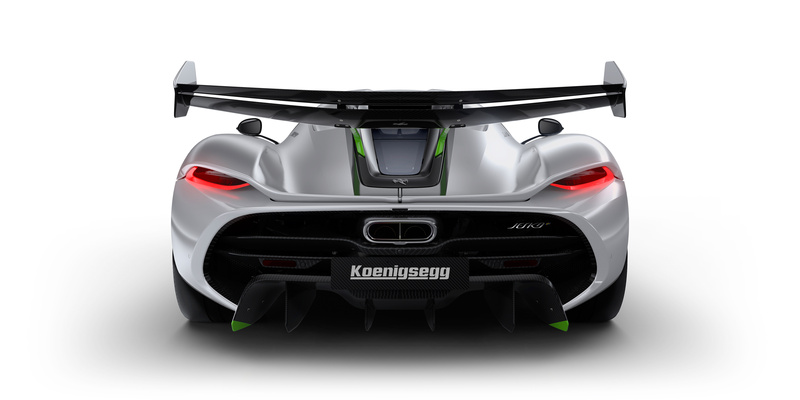 At the core of every Koenigsegg is its carbon fibre monocoque chassis. Jesko features a monocoque that is 40 mm longer and 22 mm taller than its predecessor. It retains all of the structural rigidity of its predecessor. This extremely stiff and strong chassis allows Koenigsegg’s engineers to concentrate on tuning the suspension for performance rather than compensating for suboptimal chassis dynamics. 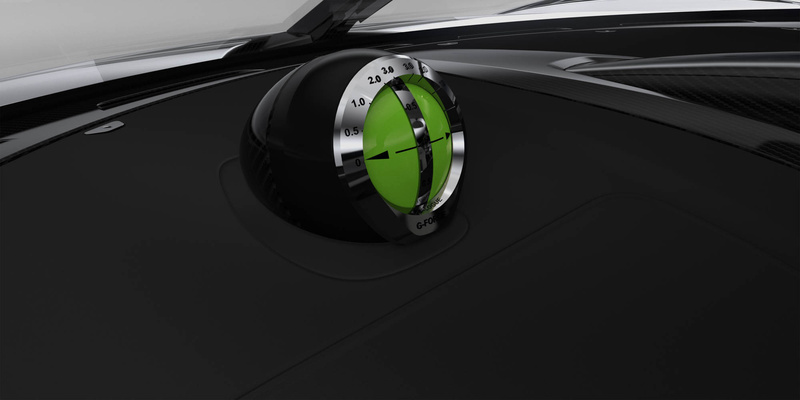 Jesko redefines ‘precision’ thanks to an additional active Triplex damper added to the front suspension and a new rear-wheel steering system. 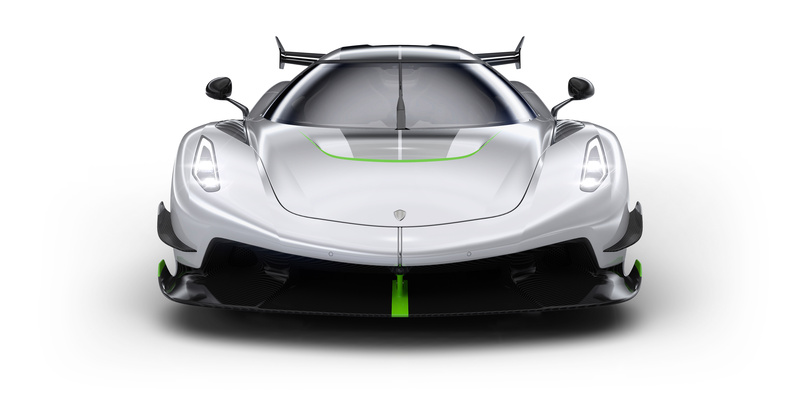 The Triplex system was first introduced in the Koenigsegg Agera in 2010. Jesko’s new optional carbon fibre wheels are the lightest and strongest production wheels of their size. Larger than the Agera RS wheels they replace, the front weighs just 5.9 kg and are 20” x 9.5”. The rear wheels are 7.4 kg and 21” x 12”. Michelin Pilot Sport Cup 2 tires come as standard. 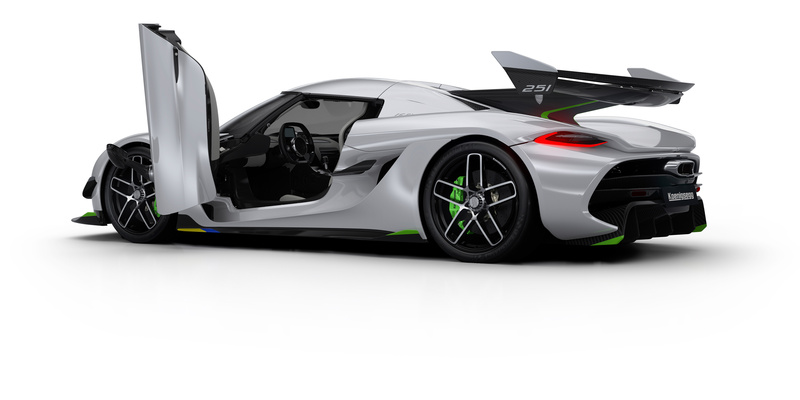 Jesko is Koenigsegg’s most aerodynamically aggressive car ever. It generates downforce of 800 kg at 250 km/h and 1,000 kg at 275 km/h. 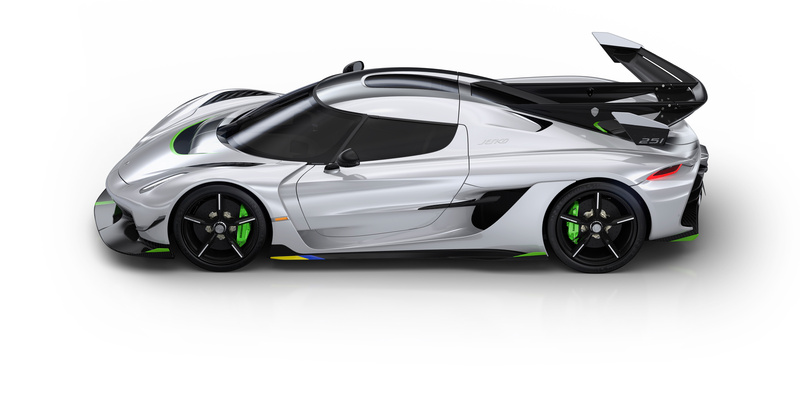 This is a 30% increase over the Koenigsegg One:1 at similar speeds, and a 40% increase over the Agera RS. 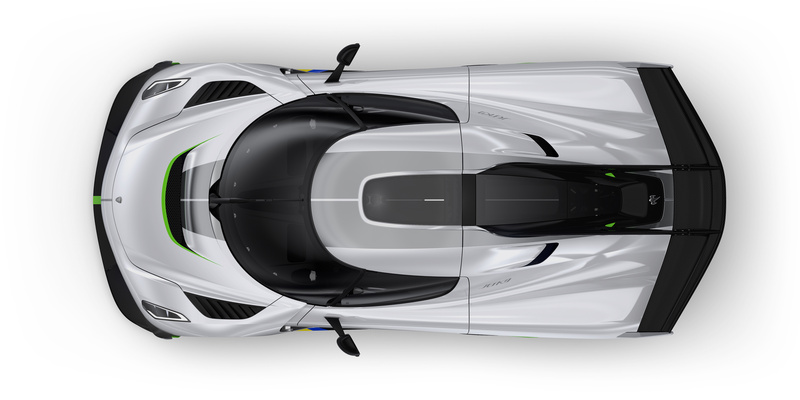 Koenigsegg’s unique dihedral synchro-helix door has been re-engineered to allow for a better opening angle, allowing easier ingress and egress as well as better protection from high curbs. The lightweight carbon roof fitted to Jesko is easily removed, transforming the car from a coupe to a roadster. 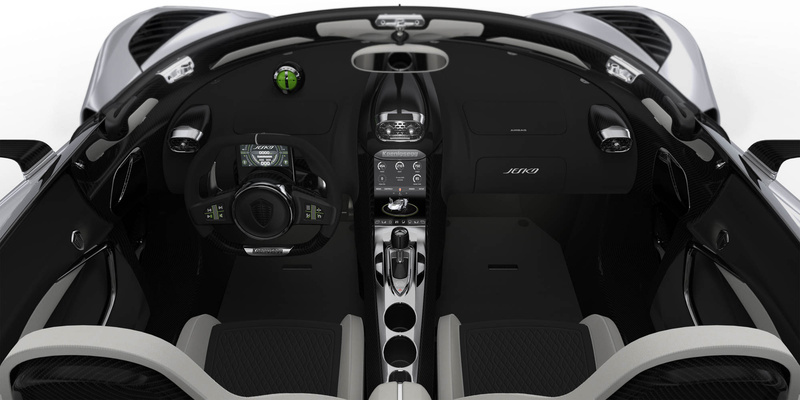 Interior amenities include TFT touchscreen, USB inputs, inductive phone charging, Bluetooth connectivity, automated climate control, leather or alcantara trim with contrast stitching, ‘bird’s eye view’ parking assistance, digital warning system, electric mirrors, seats and windows, adjustable pedals and steering, parking sensors and automated protection for Autoskin doors.